With the difficulties that some players are facing in funding their accounts at the recently launched NJ online poker sites and casinos, one savvy casino brand has come up with their own innovative solution – their own exclusive prepaid debit card. The Golden Nugget Prepaid Card is a Discover branded prepaid debit card that can be funded using your checking account or a credit/debit card. Once you load your card, you can use it to transfer funds to your online Golden Nugget casino account. Because the card is sponsored by Discover, you can also use it anywhere that the Discover Card is accepted. 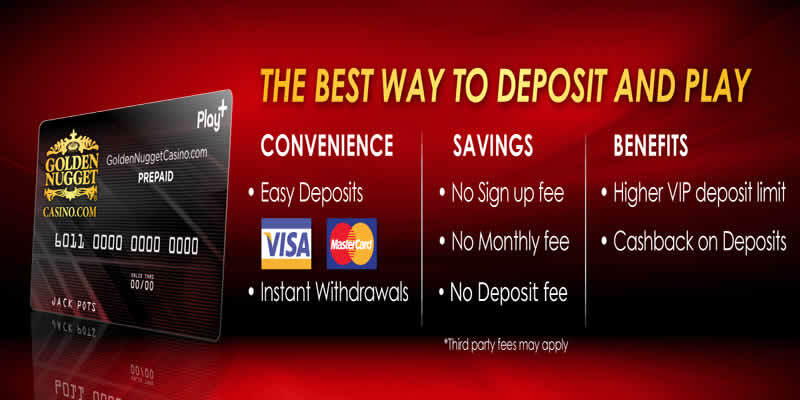 This was a brilliant move by Golden Nugget and is a perfectly viable and user friendly option for making a deposit into your online gambling account. This move certainly places them among the most innovative brands that have launched in New Jersey. We suspect that other casinos will be following their example very quickly as it eliminates many of the issues players have been facing in funding their accounts at the new state licensed gambling sites New Jersey, Nevada and Delaware. Upon further investigation, we found that there are some significant benefits to using the Golden Nugget prepaid card. The obvious one is that it provides a viable option for players who have had problems with getting their bank issued credit or debit card to work at online casinos, including the US based ones. Several of the credit card companies and banks are refusing to get on board even though legal US based online gambling is a reality now. Additionally, accessing your funds and transferring winnings to your bank account through the prepaid card is very easy and efficient. Transferring your winnings from your casino account to your card is basically the same process that you used to fund your gambling account. Once the funds are loaded onto the card, you can transfer them to your bank account or access the funds using an ATM machine. You can also leave the funds loaded onto the card to use again at Golden Nugget or at any Discover Card merchant. This payment solution offers a lot of flexibility and can be used across a far reaching merchant network both online and offline, which is definitely a nice benefit. As with all prepaid gambling options, the Golden Nugget prepaid card provides an added layer of security by prohibiting all parties from accessing your personal financial information. Your bank account number, credit card and debit card numbers are never shared with the online casino or third party merchants at whom you are making a purchase; hence you are well insulated from most cyber crime risks. Lastly, the prepaid nature of the card can serve as a self imposed spending limit that keeps you from spending beyond your means and getting into financial trouble. These benefits are something to consider when determining exactly how you intend to finance your online casino or poker accounts. Obtaining the Golden Nugget prepaid card is rather simple. There is no credit check required due to the prepaid nature of the card, hence registration is easy and quick. Once your registration is completed on their website, your card will be sent to you in the mail. You will keep the same card for all account activity, reloading it once funds are depleted. You will be issued a pin number that will be required for all transactions and that provides necessary security for your card, protecting you should it be stolen or lost. You can manage your account from the Golden Nugget prepaid card website or by using the official mobile application which you have access to once you are an account holder. The mobile app makes it easy to manage your account and process transactions while on the go. We are glad to see the prominent online casinos brands taking the initiative to provide players with options for account funding. The reports of players who have had trouble depositing money into their accounts for online gambling have been pouring in ever since the US based brands have launched, and the credit and debit card companies have not been exactly quick to cooperate in finding a valid solution. You snooze you lose In many areas of life, and it looks like the prepaid card platform is going to get the most following when it comes to US based online gambling participation, bypassing the credit card companies and banks who are stubbornly refusing to cooperate in developing safe and reliable US friendly online gambling deposit methods. Prepaid gambling options are one of the methods of choice at this time for US players attempting to engage in online gambling at the state sponsored gambling offerings as well as the legally licensed and regulated gambling sites located outside of the USA. You can visit our other USA friendly prepaid gambling pages to learn more about the best prepaid payment solutions that facilitate account funding for US players, including our guides on Union Pay, PasteandPay Prepaid Vouchers, and MST Gift Cards to name a few.